An interview with Geoff Follin was recently conducted by Dr. Z, published to TwitLonger and linked on twitter on April 22nd, 2018. We were excited to learn more about the history of the Follin Brothers; particularly from the perspective of Geoff, from whom there was previously very little information available. It enriches our understanding of the work relationship between Tim and Geoff and how their game music came to be. We are republishing the interview to assist in preservation and searchability. A few minor edits have been made, though the original interview can be found here with some additional information and context from the interviewer. Special thanks to Dr. Z for reaching out to Geoff and sharing this information. Dr. Z: What was your musical background like growing up? Geoff Follin: We had a piano in our house which my grandma and mum both played: hymns, show tunes etc. We also had church where I sang in the choir: hymns again and part harmonies, Handel etc. Started to learn trumpet in school about 9 years old, had several months of piano lessons when I was about 11, carried on with trumpet into late teens. Picked up guitar and piano again in teens. Z: Which instruments are your favourites? (Playing them, how they sound, etc). Geoff: I like most acoustic instruments – as well as electric guitar. You can’t beat a real orchestra – or any acoustic sound for that matter. I like playing the acoustic guitar and now my son is learning fast, it’s nice to share a love for it. I must say though that I love playing the piano most of all. I have a Kawai acoustic upright which has a nice rich sound and love playing that. If I had a big house and £20000 to spare, I’d buy a grand piano! Z: What was your life like before you became a video game composer? Geoff: I had a great upbringing with my two brothers and mum and dad. I was ok at school, liked playing sport and being outdoors in nature. This love of nature led me to study Environmental Biology at Nottingham University. After I graduated, I tried working in agriculture, walking round potato fields, but I was glad when my brother Tim invited me to meet up in Manchester. We didn’t have a computer at home until my older brother Mike bought ZX Spectrum… I can remember being so impressed when he showed us all how he could get it to change the colour of the TV screen. Z: What computers did you have at home and did you and your brothers ever coordinate or “fight” for time on the computer? Geoff: We didn’t have a computer at home until my older brother Mike bought ZX Spectrum when I was about 15 I think (I think Tim got a ZX81 a little later). I can remember being so impressed when he showed us all how he could get it to change the colour of the TV screen. 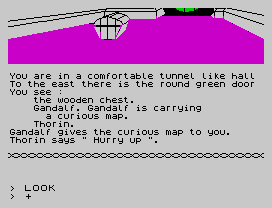 This led onto enjoying games like Manic Miner and waiting 10 minutes for it to load up a screen of text options in The Hobbit game! I must confess that I didn’t have an interest in them. I still don’t… I wasn’t into video games. Z: Did you play / had an interest in video games or did you just write music for them later on? Geoff: I must confess that I didn’t have an interest in them. I still don’t. As I said, I liked being outside and, added to the fact that like many brothers, I liked to be different, I wasn’t into video games. Z: Were there any composers that you looked up to / were influenced by? Geoff: In my teens it was mainly bands like Yes, Genesis, Rush as well as Vangelis and folk music. I got more into classical music at university with composers like Debussy and Stravinsky. I also started playing the piano more seriously and began a life-long love/struggle of playing Chopin, Debussy, Rachmaninov, Ravel etc. piano music. I also like listen Arvo Part, John Taverner and John Adams. Z: How / when did you get hired at Software Creations and how old were you? Geoff: I can remember speaking to Tim and Mike on the phone from Nottingham in about April  when I was having a miserable time at work and them saying that they thought there’d be a job for me there. I was 22 then. I’d already enrolled on a teacher training course for the September, but Richard Kay of Software Creations said why not come and work for him until I went away and see how it goes. So I did a few summer months at SC – went to Leeds to do a PGCE teacher qualification until the following summer of 1989 – then went back to SC. Z: What was it like working with Software Creations and the companies afterwards? Geoff: It was good in many ways – plenty of freedom to get on with stuff and some flexibility. However, working in an office environment really got to me and, coupled with a lack of interest in the products themselves, I left in 1993 to go travelling in Africa. On return, I ‘fell back’ into the same sort of job but, apart from the convenience of working near home with my brothers, it didn’t feel right. Z: You seem to know more about music then Tim does, do you think that gave you an advantage sometimes and how long have you been a musician? Geoff: I don’t know more than Tim. He’s had less ‘formal’ training; reading music, playing in instrumental groups. That’s only one skill set. We’re probably the same regarding what really matters. Z: How did you go about making a soundtrack? Did you use actual instruments or was it pure assembly? Geoff: For spectrum, c64, nes it was just assembly: typing numbers into a pc. Same for snes, amiga but we’re able to reference some low quality samples. Z: How did you and your brother become masters with a system’s sound? Were there any tricks you did so you got the best sound possible on a given system? Geoff: Well that’s down to Tim and him working with the programmers at Software Creations, including brother Mike. He kept pushing what he wanted from the music drivers. I just worked with Tim on the compositions, arranging and sampling. For technical details, I’m the wrong brother! Z: Does that mean you won’t know why the sound engine to your Game Boy soundtracks sound different on the early games you composed for the system? Did Software Creations rush their Game Boy ports therefore not giving you enough time to work with the music? Geoff: Er…. Sorry. I am definitely not the person to ask. Tim might remember if you ask him. I’ll let him know that you’d like to know. Z: Which system did you like working with the most and which system did you like working with the least? Geoff: I suppose the snes was exciting cos we started to use real instruments to sample. [I] didn’t like gameboy as it sounded the worst to me. Z: What was the easiest and hardest part of making a soundtrack? Geoff: It wasn’t so much difficult as frustrating for me as you had to make so many compromises musically. It taught you to play to the systems’ strengths, hence the arpeggios and to compose in your head (we didn’t have a keyboard until a sampler for the snes). Z: It’s well known that Tim doesn’t like a lot of his video game music, however I have wondered for years (and probably others too), do you feel the same way about your video game music? Or do you actually like it? If so what’s your personal best and worst soundtrack? Geoff: Afraid to say I’m with Tim: I don’t like it either. I gave up teaching last year and had a chance to listen to some old stuff on YouTube. Didn’t hear anything that made me think, ‘Oh I like that. I’ll do a new version.’ I suppose I just hear the compromises and inexperience! Z: What was your first video game soundtrack? Geoff: I can’t remember. 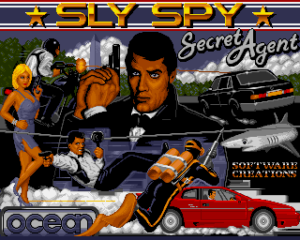 Sly Spy? Z: [VGMPF link] This is from a database about video game music, are there any incorrect entries on here like games or dates, or even games that you did that are not on this list? Geoff: It looks like a fair list to me. one reason I can’t remember too well is that sometimes I wasn’t too aware of what music was for what game at first. Geoff: No. Sorry. Don’t have anything like that. Z: Will you ever make chiptune music again (like on the C64), or do you at least miss writing music for a particular system? Geoff: Again. Sorry but no. I now can write for any instrument and relish it. Z: Were you ever a part of a demoscene for a system, if so what do you think of it now? Geoff: No. Not sure what one of those is! Tim wouldn’t mind me saying that I worked quicker than Tim and produced more quantity and he more quality! Geoff: Mainly on our own but sometimes joined up. Tim wouldn’t mind me saying that I worked quicker than Tim and produced more quantity and he more quality! Z: Silver Surfer is one of the most famous soundtracks you ever co-composed for, which tracks were done by you and which were done by Tim? Z: Going back to Plok for a moment, there’s a rumour that when you co-composed the Plok soundtrack with Tim, Shigeru Miyamoto thought the SNES was modded when he heard the soundtrack because he didn’t think the console was capable of making music sound that good, is this true? Geoff: Can’t say I know anything about that. I remember that we worked a lot on the samples. We have always regarded SOUND as a key element in any compelling video game. And thanks to our team of in-house musicians and sound tool engineers, we have created unrivaled sound on home video game systems as well as on home computers. We produced the sound for SUPER OFF ROAD on the SNES, now used as a benchmark by Nintendo for evaluating the music and sound of other SNES games; we also pioneered simultaneous music, sound effects and speech for ROCK AND ROLL RACING; PLOK – one of our own titles – has arguably the best ever sound of any console or platform; and EQUINOX is widely held to feature the most atmospheric games music yet heard. Z: Do you have any regrets? (Opportunities you didn’t take, things you wish you did better, etc). Geoff: Not really. Would have been nice to do some more famous games but I’ve got to be honest and say my heart was never really into it. Tim and I were given the freedom to go record samples away from the office, like train track rumbles at the local station. It became a bit of a catchphrase when we didn’t show up in the office as in, ‘Where’s Tim and Geoff….oh. Sampling’ when we were probably just driving in late. Z: Any “interesting stories” you have over your time as a video game music composer? Geoff: Can’t remember much but can remember that Tim and I were given the freedom to go record samples away from the office, like train track rumbles at the local station. It became a bit of a catchphrase when we didn’t show up in the office as in, ‘Where’s Tim and Geoff….oh. Sampling’ when we were probably just driving in late. Z: Any advice for admiring video game composers? Geoff: I suppose it would be listen to and enjoy as much music as you can and let it inspire you! Geoff: The latter. Just wasn’t interested and decided to go travelling to sort out what I really wanted to do. Z: What was your experience as a video game composer like overall? Geoff: I was lucky to earn a living doing it, but knew I wanted to do something more fulfilling for me personally and so [I] needed to leave. Z: On a more personal side, the last thing that was heard about you for a long time was that you became a primary school teacher, what made you decide to take up the job and what made you quit almost a year ago? Geoff: I wanted to do something more fulfilling for me but also enjoyable and creative and valuable. I was trained to teach science at secondary level but primary let me teach lots of things including music. I also thought I’d stand a better chance if finding a wife which I did! Nicola went back teaching full time last year in the school where we met, so I left and am now tutoring in maths part time which allows me more time for music! Z: Has anyone at the school you worked at found out you are a legendary ex video game composer? Geoff: Ha! Not sure they know… Or are interested! Z: Were you ever in a band? Z: Your YouTube account shows new music made by you and even by you and your family, is this recent or have you been making music for years but only kept it to yourself? Geoff: Pretty recent-last year or so. Z: Your new website SongTreasure is interesting because it actually has information about you and your family (with there even being a picture of you and your family on the website), is it weird being open about such private information when you were out of the public light for decades? Geoff: Yes it did take a bit of a new push to do it but lots [of] people said give it a go and I suppose I’m less bothered now I’m older. Z: Were you aware that you have many fans of your music, if so how do you feel? Geoff: Not really aware. My wife had Googled me and told me but I’m still not a big fan of media. So for my final question, is there anything you would like to say to your fans? Geoff: Well. If you say there are fans, I’m very flattered and would say thank you and watch out for some more music in the future. Thank you Dr Z and goodnight.